Getting back online | Walk with us! As noted previously, Fr. 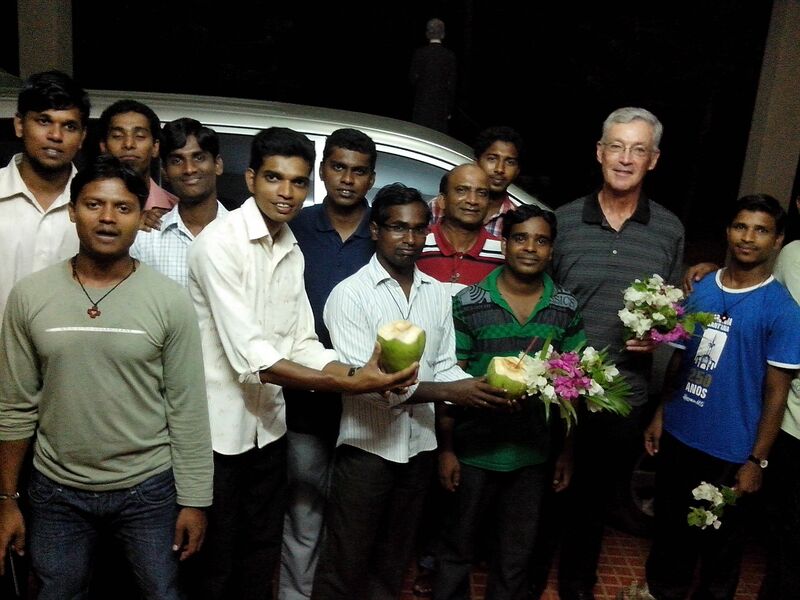 Tom Cassidy is in India through October 20 assisting with formation and administrative tasks in the district. He writes today about getting back online in a country where WiFi is a luxury, not an easily found convenience around every corner. Yesterday morning Fr. Joseph Gopu (the house treasurer) took me to Eluru to get my MacBook set up to connect to the internet via a Reliance 3 modem. It permits me to connect anywhere in India via satellite. It’s not the fastest system in the world but it works. You pay by the month so I’m good until October 17th. Now I mention all this sort of as an introduction to the experience of getting set up while shopping in a strange land. We take so much for granted when it comes to our purchases that when we’re taken out of our element it can become a strange and perplexing world. First off I would have been helpless without Fr. Joseph as the technicians were not English speakers. The two of us left our house a little bit after 9:00 am for downtown Eluru, about a seven kilometer trip (4.3 miles) where we got ourselves in a real traffic jam. The road is not very wide to begin with and trucks, as in lots of trucks, were lined up and not moving. Joseph said they were lined up to be loaded with rice. A bus passed us going the same direction but in the other (opposite direction) lane. Joseph decided to follow the bus thinking “who’s going to argue with it!” It was the wrong decision and we soon came to a halt blocking both lanes coming and going. A few motor bikes managed to work their way around it, but for the most part we all were stuck as stuck could be. Finally, an enterprising gentleman (middle age I would say) got the bus and us and a few vehicles behind us to back up. We backed up about a quarter of a mile and turned left unto a side road Joseph knew about and worked our way around any and all obstacles and into the center of town. Arriving at our Reliance 3 shop we were told it was closed for a holiday (or that’s what I understood was said). I think that something was lost in translation but they did eventually open their doors. By the way the shop is tucked away behind an ice cream parlor. I noted the ice cream parlor had a large generator out front since we lose electricity all too often it would be a disaster at a place that makes its money selling ice cream. I must say that even working in translation the technicians were able to set up my computer (actually I could have done it myself). Now here’s where the surprise comes for a stranger to Indian ways enters the picture. First of all, we all removed our shoes before entering the shop. I don’t think this happens in all shops in Eluru but certainly here everyone automatically removed their shoes. Here comes the surprise, in order to pay for the modem and one month use Fr. Joseph had to produce two identity cards, a small photo and then run out to another shop to have the cards and photo copied. I have no idea of why this was all required but I do know we could not leave the store with the modem unless and until these steps were completed. It took almost noon before we got home. That being said, I am a happy camper. When I opened my e-mail for the first time there were 65 messages. I could imagine if I had to wait a few days how many more would be sitting there! Naturally, probably 55 were pure junk!